Over the weekend, we tackled the dreaded garage clean out in order to install a subset of the old kitchen cabinets out there in the bump out. Keenan pulled everything out of the space into the middle of the garage floor, then we took down the shelf along the top of the wall which was covered with boxes untouched for a decade. Finally we maneuvered the cabinets into place, screwed them to wall studs, and headed out to buy countertops. For convenience, we purchased two smaller lengths of premade formica countertop, then ripped them to size with the circular saw. First check: the saw and saw horses get to stay. The gray organizer drawer sets that I purchased for my studio before I found the white ones have been waiting patiently for this day, when we dumped all the old scrambled drawers and toolboxes and reorganized everything. Now we actually have drawers dedicated to washers and wood screws and hose gaskets. Labels needed. It's amazing how much the cabinets will hold compared to the open shelves that took up so much space. The sturdy angle iron shelves are next to vanish, in order to get the cars back inside out of the wicked sun. I’m writing on behalf of the visual editor for HouseLogic.com to request your permission to use one of your photos on the site. The photo nicely illustrates a topic we’re writing about. HouseLogic, published by the National Association of Realtors®, covers home ownership-related topics. 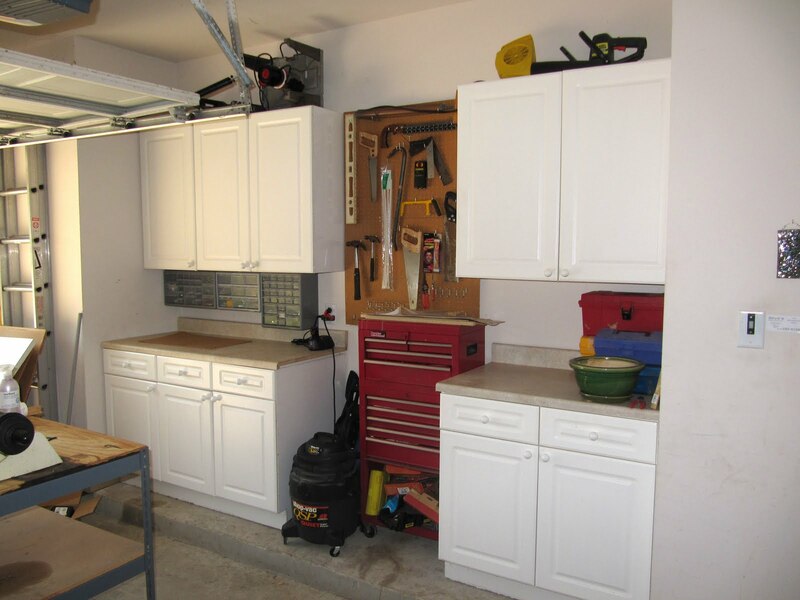 Specifically, we’d like your permission to use the attached image of a kitchen cabinets in your garage in connection with the slideshow about garage storage. The image may also appear as a link back to that slideshow in such places as our email newsletter; social media, including Pinterest; marketing; companion site for REALTORS®; and web site home page. The use may require that we resize the image to fit the size constraints of our website. We’re asking you to grant the National Association the non-exclusive, royalty-free right to use the image as described above for as long as the topic is included on the HouseLogic site. We would include a credit to you in the caption accompanying the image in its primary location on HouseLogic. If you would like we could also link that credit to your website. If you approve, please respond to this email confirming that you own the image rights, have the authority to grant to the National Association permission to use the image as described, and grant that permission. Please also let us know how you would prefer to be named in the credit. My deadline is Friday, July 6th, 2012 and I would need a response from you before then, if possible.